With thousands of units being used throughout the world, the OmniScan® MX is a field-proven, reliable instrument that is built to withstand harsh and demanding inspection conditions. Compact and lightweight, its two Li-ion batteries provide up to 6 hours of manual or semi-automated inspection time. The highly legible 8.4 in. (213 mm) real-time color display of the OmniScan MX enables you to see defects and details under any light conditions. 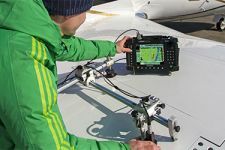 Navigate your way through the instrument’s simple and intuitive interface using the scroll knob and function keys, or by connecting a USB mouse to facilitate the inspection analysis. Eddy current array (ECA) technology incorporates several traditional bridge or reflection (driver-pickup) probe coils in order to achieve a much larger coverage in a single inspection pass. Additionally, each ECA probe model is carefully designed to maintain a high probability of detection of a targeted defect range, all along the probe length. With the OmniScan® MX ECA, you can use ECA probes at fast manual-inspection speeds, offering a powerful and productive inspection with color representation and archiving capability. Eddy current testing (ECT) technology works on the principle of magnetic coupling of a probe sensor (coil) close to a test specimen (conductive material, ferromagnetic or non-ferromagnetic), generating eddy currents inside the test specimen, and displaying signals on the instrument’s impedance plane. With eddy current technology, you can detect defects through thin coatings (such as paint), as long as the distance from the probe to the metal is kept reasonably low—typically in the order of 0.5 mm to 2.0 mm. As eddy current array and ECT technology share the same basic principles (and physics), it can also perform inspections through paint while offering all advantages of ECA, including large coverage, fast scanning, high probability of detection and color imaging. Probes used to perform eddy current inspections are made with a copper wire wound to form a coil. The coil shape can vary to better suit specific applications. The alternating current flowing through the coil at a chosen frequency generates a magnetic field around the coil. When the coil is placed close to an electrically conductive material, an eddy current is induced in the material. 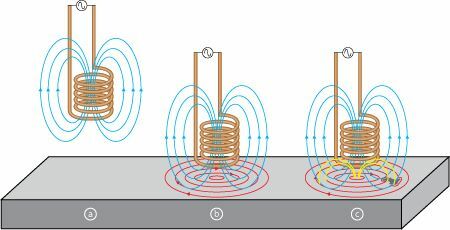 If a flaw in the conductive material disturbs the eddy current circulation, the magnetic coupling with the probe is changed and a defect signal can be read by measuring the coil impedance variation. 3 USB ports, Video output Video out (SVGA), Ethernet 10/100 Mbps, 2-axis encoders, 4 digital inputs (TTL). –20 °C to 70 °C (–4 ºF to 158 ºF) Relative humidity 0 % to 95 % noncondensing. No air intake; splashproof design. Absolute, differential, bridge, reflection (driver-pickup) for both ECT and ECA probes. Support select BondMaster pitch-catch probes through use of an adaptor (scanner also required). Automatic probe recognition and setup for ECA and BT probes. ECT and ECA: 34 dB to 74 dB. BT: 28 dB to 68 dB. Additional adjustable software gain of 0 dB to 30 dB. 1 Hz to 15 kHz, variable depending on configurations. 3 alarms, each configurable as Pie, Box, Ring/Circle. Alarm output as Visual, TTL and Sound. Yes - one channel only. Can drive up to eight different frequencies at the same time. Detection similar to that of the BondMaster® 1000e+ instrument, since the same probes are used. Designed to support pitch-catch probes. Two-axis encoding scanner is required to produce the C-scan. Olympus is proud to launch our new bond testing OmniScan® solution—a big step forward in the field of composite inspection. Now, easy-to-read C-scan imagery is possible using a portable instrument. This OmniScan solution is ideally suited for disbond detection in honeycomb composite, as well as equally accurate delamination detection. Primarily designed for aerospace in-service inspection, this solution is also useful for the manufacturing sector, including the automotive and naval industries (e.g., for composite boat hulls). Customers who already own an OmniScan® ECA or ECT module only need to order the standard BondMaster® probes (P14 and SPO-5629) and the BondMaster cable that are required to complete this solution. Our customized MXB software has been developed especially for composite inspection; new features, such as the wizard and normalization, help to keep operation simple for the user. Encoded system: any two-axis encoding scanner can be used to inspect a part. Olympus offers two options: the GLIDER™ scanner, which is well-suited for flat or slightly curved surfaces, and the WING™ scanner, which is specially designed for scanning curved parts (e.g., aircraft fuselages) and can even be used upsidedown due to its Venturi vacuum-cup system. For more versatility, a handheld one-axis encoding scanner, equipped with an Indexer Clicker, is also compatible with this system. Again, Olympus innovates by introducing a new way of displaying on-screen data. For each C-scan, the operator has two viewing options to choose from: the amplitude C-scan displays color variation based on the amplitude of the signal, regardeless of the phase, which is ideal for clear and efficient disbond detection; or, the phase C-scan uses a 0° to 360° color palette to display changes in the phase angle, making it easy to distinguish between different types of indications, such as putty (repair) and delamination. This solution is available in two different configurations, both requiring these standard components. With the exception of the added capacity to electronically switch between elements, eddy current array (ECA) technology is essentially the same as ECT technology. Eddy current array is easy to operate and calibrate. The new OmniScan MXE 3.0 ECA software has been redesigned to facilitate the transition from a conventional ECT instrument (such as the Olympus Nortec® 500) and to offer the power of ECA in a much more accessible way. Calibration of ECA is done in a nearly identical fashion as conventional ECT. The principles of lift-off, gain and null adjustments are maintained so calibration is no more complex or time-consuming than usual. Generate live lift-Off signals with ECA probe – just like with a conventional ECT probe. Adjust the phase angle in real time with the OmniScan knob. Gain, Vertical Gain and Null Point (H/V) can also be adjusted the same way. Eddy current array has a unique ability to perform inspections through thin coatings on conductive material. This capability provides a tremendous advantage over existing methods, such as penetrant testing, magnetic particle or magneto-optical imaging (MOI), as the need to remove and then reapply paint or coating is eliminated completely. 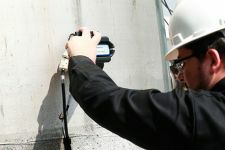 Over time, this provides you with enormous cost-savings, and most importantly, your inspections will be chemical-free. Scan using a standard ECA probe that features the same color representation as the red dye PT (patent rights protected). The sensitivity can be adjusted to reveal more or fewer defects. No need for paint removal. One-step inspection, high scan speed, and instant results. Major time-savings (typically 10:1 and over). Adjustable sensitivity and post-process analysis. Environment-friendly method (no chemicals involved). The MXE 3.0 ECA software features a range of patent-rights-protected color-palette representations that replicate the look of traditional NDT methods and facilitate the intuitive display of ECA signals. Even after an in-field inspection has been completed, the OmniScan® MX ECA continues to provide value thanks to integrated data-storage, analysis, and reporting functionalities. With the OmniScan MX ECA you can review individual indications and apply corrections as needed. The new MXE 3.0 ECA software features newly redesigned, intuitive data cursors that can be operated directly from the instrument (on-site) or with a mouse connected by USB (office use). New MXE 3.0 selection cursors are very intuitive and allow to quickly select any indication. Corrections can be easily done on recorded data. Above example shows gain (contrast) adjustment. The OmniScan MX features built-in reporting, at the touch of a key. Reports can also be configured and customized by advanced users. However, the factory-default report format already includes a screen shot and carefully selected, preloaded data fields that aim to eliminate the need for customization. Archiving of inspection data files is also very easy; at any time (during acquisition or analysis), a single press of a key will instantly store the data on the instrument memory card. Perform data analysis quickly and efficiently with mouse input. Archive files to a PC with the help of a CompactFlash reader. The OmniScan® MX ECA not only displays ECA signals in a conventional ECT impedance plane view but also offers several other views and layouts where the user will begin to recognize the true power of encoded ECA technology. These displays can be made part of the calibration workflow and can make eddy current testing highly visual and even go/no-go, based on user defined acceptance criteria. Thanks to its intuitive interface design, the OmniScan MX ECA is quick and easy to configure and operate. It is as simple as one, two, three. 1 Adjust the usual ECT controls in real time using the live impedance plane. 2 Activate the encoder and C-scan display. 3 Fine-tune the settings and get ready to perform the inspection. Contrast adjustment using the gain in full C-scan display. The advantage of time-based inspection is its virtually unlimited scanning capacity with minimal instrument interaction, whereas the benefit of encoded scans (C-scan images) is the ability to produce valuable color-coded images and information related to flaw position, shape, and dimensions. The MXE 3.0 ECA software introduces a new Continuous Encoder mode that enables encoder-corrected imaging while maintaining the user-friendliness of a time-based inspection. With this mode, inspections are highly productive, with indications being recorded at your discretion. As with conventional eddy current technology, flaw severity is closely correlated to the return EC signal amplitude in most surface or near-surface applications. By using an amplitude-based color code, and plotting each channel’s return signal with encoded-position information, the resulting C-scan display is highly visual and intuitive. These scans can be saved to the removable CF card or generated into a report onboard the OmniScan® MX. A reference standard with known depth defects is necessary to calibrate the sensitivity and contrast of ECA. Image of a calibrated ECA scan showing different colors for each defect depth range. Actual aircraft skin showing corrosion indications. The colors indicate the depth of the defects. With the OmniScan MX ECA, you can accept or reject indications based on the C-scan color display. The MXE 3.0 ECA software contains a wide range of factory-tested color palettes that optimize the signal display for any ECA application. Additionally, the new C-scan alarm feature simplifies the gating of reject signals, as it instantly changes the C-scan colors when the impedance plane signal enters the alarm zones. With the alarm feature, the C-scan changes color whenever a signal enters the reject zone. Some inspection procedures may specifically require ECT while ECA can easily help you cut time and find problem areas. With the OmniScan® MX ECA, you don’t need to commit to just one technology at the start of an inspection. Pressing and holding the menu key anytime during an inspection allows for instant switching between ECA and ECT modes. Both probes can remain connected and configuration setups remain active. ECA interface (blue) is as easy to use as the ECT mode or a Nortec 500. ECT interface (green) includes several features for procedure compatibility, such as adjustable null position. The OmniScan MX in ECT mode includes a high quality signal digitizer and all-digital signal processing chain for minimal signal loss or distortion. This, combined with its bright, large display, makes the OmniScan MX in ECT mode one of the world’s finest ECT flaw detectors, displaying high-quality signals every time. The OmniScan MX in ECT mode also allows the use of most existing Nortec® ECT probes, through the use of new cables and adaptors. Olympus offers a range of productive solutions to detect or evaluate the depth of surface-breaking stress corrosion cracking. These solutions are based on the OmniScan MX ECA, a powerful and easy to use eddy current array flaw detector. The Doubler Edge Skin Crack Inspection solution utilizes the latest ECA technologies for subsurface detection. The C-scan allows for higher probability of detection and better reproducibility. This solution is a major step forward in terms of reduced inspection time. The Surface Crack ECA solution proposes an ergonomically-improved version of the SBBR-026 high-resolution ECA probe. This solution detects surface-breaking cracks at a very productive rate, even through paint and thin coatings. This is particularly well-suited for performing fast inspections of aircraft fastener rows. The Subsurface Crack ECA inspection solution is capable of scanning through the first aircraft layer (skin) to detect cracking present on the 2nd layer, without the need for paint removal. This solution is available in two ECA probe versions (commercial and military aircrafts), both covering at least 64 mm in a single pass. The Subsurface Corrosion ECA inspection solution performs rapid inspection of large areas for potential corrosion. Available in two probe versions (commercial and military aircrafts), this solution can evaluate the severity of hidden corrosion (defect depth) in an instant, without the need for paint removal.